Perhaps you can tell me why in Quebec a stop sign says "ARRET" while in France it says "STOP" ? Quebec is literally surrounded by English-speaking provinces and states, so in fear of being assimilated, Quebecers have always been on the defence of their language and culture. So Quebec is an unilingual French province and they want to keep it that way, so much that they even made a law that renders non-French signage illegal (though I can't guarantee it covers non-commercial signage such as road signs). However, their MUTCD does have a spec for a standard English "STOP" sign, and it's used in some English-speaking regions (Montreal West-Island, Kahnawake, etc.). Ironically, there isn't a bilingual version like the ones seen in Ottawa. Europe has so many different languages in such a small area that they have to resort even more to something that everyone can understand, and it seems that "STOP" is a widely accepted term. Also, the French aren't as defencive on the language issue as Quebecers. I think that the Vienna Convention does allow Stop signs in the country's native language though. Quebecers are even more protective of the French language than the French, who are pretty protective as it is. In some of these regions, cars don't even have license plates, so MUTCD compliance isn't that much of a priority either. I wonder what percentage of the population up there speak only Cree. Something tells me it's not that much. dunno; everyone I interacted with way up north spoke perfect English. People that spoke only French were confined to the southern parts of Quebec. Signalisation Routière (MTQ's traffic signing manual) treats "STOP" on the stop sign as if it were a word in French. Therefore, the traffic sign layouts for stop sign installations show two versions of the stop sign--"'ARRÊT' ou 'STOP.'" An engineer working to the manual, if he or she is insensitive to community sentiment about language, could very well put "STOP" in a monolingually French-speaking neighborhood. It has been a dozen years since I was last in Montréal (late August/early September 1998), but I remember some bilingual signs on the autoroutes. I think MTQ leaves bilingualism on guide signing to designer discretion, which will in turn be related to community acceptance. None of the specimen sign illustrations in Signalisation Routière show bilingual messages. It is also my understanding that Signalisation Routière shows no diamond-shape, yellow-background permanent warning signs with text-only messages. Such signs (e.g., "LENTEMENT") are however used by local authorities, who occasionally ignore this aspect of the MTQ rules. Many of MTQ's own construction signs (orange background) have text messages only. J N Winkler: You are right, I couldn't find any standard warning sign with a text message except for those temporary construction signs, though I don't know if there's a specific ruling that bans them, since I do not have the complete "Signalisation routière / Traffic Control Devices" book (they don't even provide a free PDF). There occasionally are bilingual signs, but they are relatively rare. Most notably, Montreal's South shore bridges are signed in both languages, but I'm not sure of the reason; the stories I've been told don't add up. There's also a "TUNNEL - RALENTISSEZ / TUNNEL - SLOW DOWN" at each end of the Beauharnois Canal tunnel on Route 132.
rickmastfan67: I've been planning to. Unfortunately, no. Even the online version costs $180... per year. So only the standard sign specs and vectors are free. The Tunnel is part of the St. Lawrence Seaway Authority…….a Federal Crown Corporation so I believe federal bilingualism laws would apply. I didn't know that the Melocheville tunnel was controlled by the Federal Bridge Corporation. That makes sense. Thanks for the info. Yes, it's because it's managed by the federal government. Just skimmed this thread. I majored in French, and try to keep up; and also have a law degree, so without getting into the politics of this - just trying to stay in observer mode because it's none of my business - I pay as much attention as I can to the way Quebec manages language use, just because I find it fascinating. I've always assumed that the bilingual signage on the 10/15/20 bridge and its approaches was because it was a federal facility. But I think Dr. F. may be mistaken about commercial signage; wasn't the sign law as applied to private businesses found unconstitutional (yes, they have to use French, which seems perfectly reasonable to me, but they're no longer forbidden to use English as well)? Downtown Montreal really looked pretty bilingual last time I was there (2006). Indeed, English (or any other language) isn't forbidden (I don't think it has ever been), but it has to appear in second, and there's something about it appearing in an equal or smaller size. I think second languages (including English) were prohibited on outdoor commercial signage, but that's going back to the early '90s. In fact, QC road signs were bilingual until the first Parti Quebecois separatist government, elected in 1976, decided to turn them all french only. So since this time, the only bilingual signs on highway supersignage are on federal-owned highways and structures - Jacques-Cartier and Champlain bridges in Montreal, as well as some parts of Honoré-Mercier bridge (split-ownership between federal and provincial gvts), and Melocheville Tunnel on QC-132 at Beauharnois. The federal agency that manages those structures is the JCCBI (stands for the Jacques-Cartier & Champlain Bridges Inc.), or in french, PJCCI (les Ponts Jacques-Cartier et Champlain Inc.). Some exceptions exist in some areas, especially around Montreal. In some english-speaking parts of the city, some municipal signs are still bilingual. The only exception I know on a provincial-owned highway is on QC-132. When the MTQ rebuilt the road on the territory of Kahnawake indian reserve, they add a reserved lane eastbound between Chateauguay and QC-207 in Kahnawake. The signs for the reserved lane, were in french, in mohawk, but not in english! I think some people, at the MTQ, have a direct dislike for english language. But this is another story! Regarding commercial signage, one of the most famous, or infamous depending on your point of view, examples is surely a well-known fast-food chain. I believe I read somewhere that the language police decided the full name is merely descriptive of what they sell, so it had to be in French. 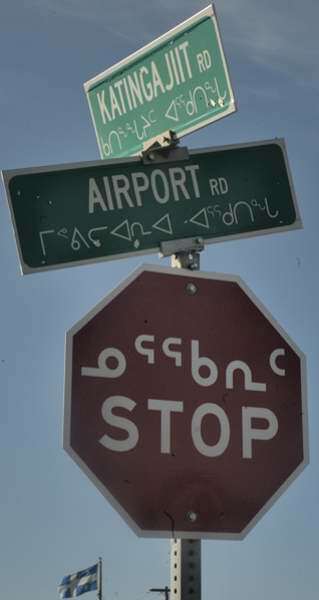 In Quebec's far northern Kativik region, the stop signs and street signs in the "county seat" Kuujjuaq are bilingual Inuktitut-English, not a trace of French. In fact, QC road signs were bilingual until the first Parti Quebecois separatist government, elected in 1976, decided to turn them all french only. No, that would be the Loi sur la langue officielle (Bill 22), adopted in 1974 by a National assembly comprising a vast majority (93%) of unionist (Liberal) MPs. That bill established French as the official language for governmental services as well as legislation and justice ― among others. The metric conversion sign replacement program featured monolingual signs. No. These exceptions are, in absolute figures, primarily outside the Greater Montréal. The French Language Charter's section 29.1 grandfathered in the possibility for non-provincial public institutions (municipalities, local development centres, housing bureaus, etc.) serving a majority of English-speakers to offer prominently English services. A majority of these institutions (including west island communities) do not serve a majority of English speakers anymore; the the bilingual acknowledgement stays until the institution itself asks for removal. Note that even though the 2001 mass town mergers disbanded municipal institutions, the boroughs they formed have kept bilingual designation. MTQ workers obey the provincial statutes and regulations, the Regulation respecting the signs and posters of the civil administration prescribing French road signage among others. Speaking of indian reserves, the Abenaki reserve of Odanak have a trilingual stop sign. The shot dates from Sept. 2014, I don't know if the sign was replaced since. Odanak still has and maintains trilingual Français/English/W8banaki8dwaw8gan signs. Regarding the special northern regime, Kuujjuaq would be more of a "capital" for the Kativik regional government ― the closest thing to a protectorate in Québec. The territory under KRG administration is subtracted from the application of numerous statutes and regulations or parts of them in various domains (health, education, environment, ...), although jus soli remains québécois. This also applies to institutional/official language. The "language police" you are referring to is KFC itself in this case. The name PFK was current well before the Charter came in effect in 1979. 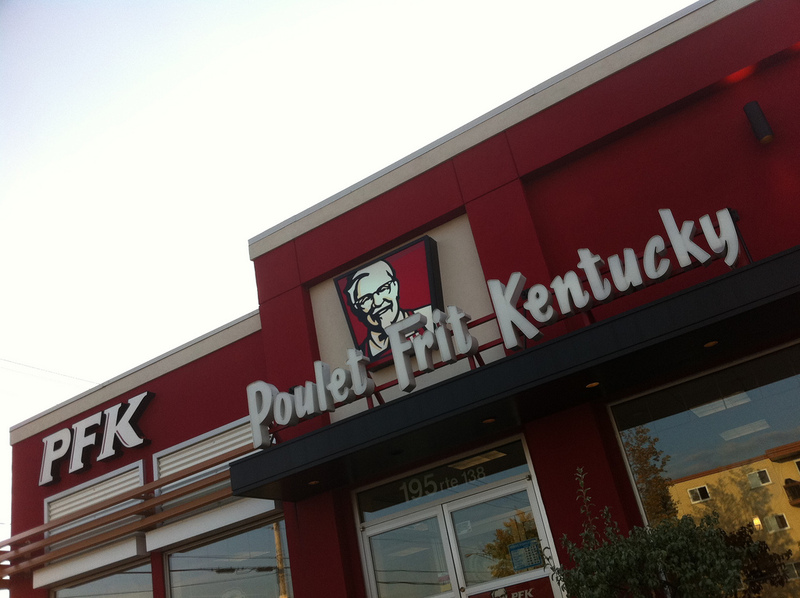 KFC replaced Chez Scott - La villa du poulet joints in some places, a chain somewhat related to KFC that also adapted to the cultural context, being known as Scott's Chicken Villa in its hometown of Toronto. KFC and Staples were may be advised to change their name, but never would they have been forced to do so. Other American or Canadian chains that opened joints or shops in Québec made the choice of keeping their original namesake (Burger King, Dairy Queen, Home Depot, The Brick, Jack Astor's Bar & Grill, Best Buy, Canadian Tire, Future Shop, Costco Wholesale, ...). The Charter of the French Language does not force any corporation to change its name, but rather suggests to add a French element to signs (Les cafés Second Cup, Home Depot l'entrepôt de la rénovation au Québec, etc.). If you do not pay attention, you would not even notice. Former Liberal (unionist) Culture and French language minister proposed last year that this become an obligation ― which it did not. Same reason stops signs say ALTO in some Spanish-speaking countries and STOP in others.